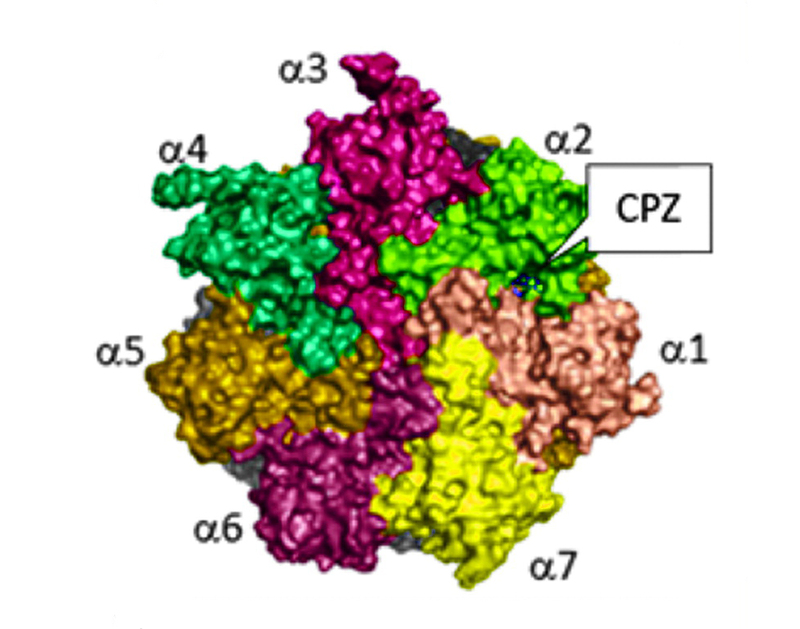 Preferred docking site utilizing Autodock Vina of chlorpromazine (CPZ) in the a1/a2 intersubunit binding pocket of the a-ring of the 20S proteasome. The ubiquitin proteasome system (UPS) provides a mechanism for clearing damaged proteins from cells, as well as the regulated proteolysis of intracellular proteins. The success of the proteasome inhibitor bortezomib as an anti-cancer agent has fueled efforts to discover proteasome inhibitors that raise proteins levels with beneficial effects. However, activators of proteasome activity may also be useful for ridding cells of toxic proteins, as occurs in Parkinson disease, Alzheimer's disease, amyotrophic lateral sclerosis, and progeroid syndromes. Recently, a few reports have described screens for proteasome activators using either cell-based or biochemical assays aimed at proteasome activity (e.g., Lestemaker et al. Cell Chem Biol 2017;24:725–736). The 26S proteasome is organized into a 20S core containing α-subunits that form a ring and have a gating function, β-subunits possessing protease activity, and two 19S particles that function as regulators of ubiquitin binding and substrate unfolding. The paper by Jones et al. used purified 20S proteasomes and pro-fluorescent peptide substrates such as the chymotrypsin-targeted peptide suc-LLVY-AMC. 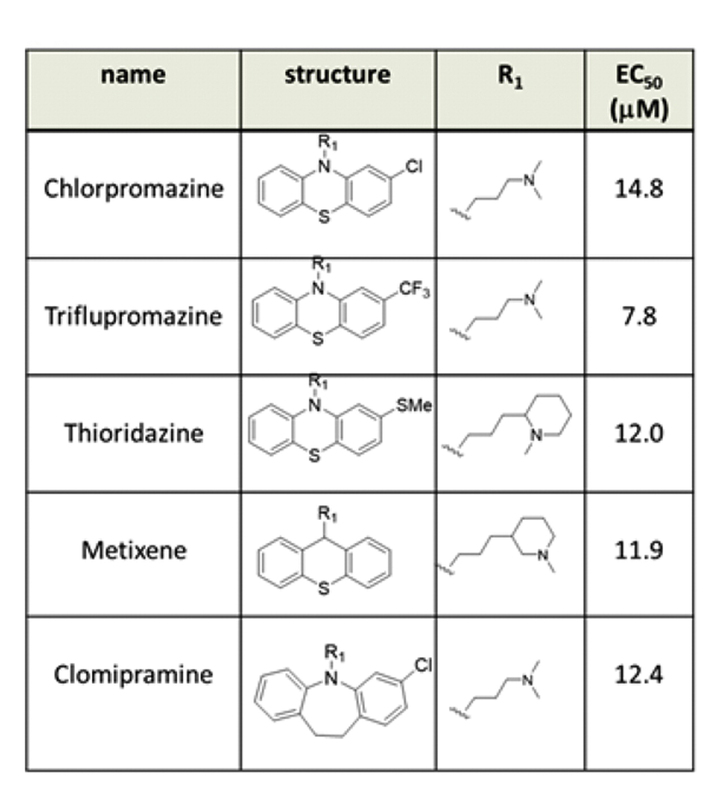 EC50 values of phenothiazines for enhancement of 20S proteasome chymotrypsin-like (CT-L) proteolytic activity. 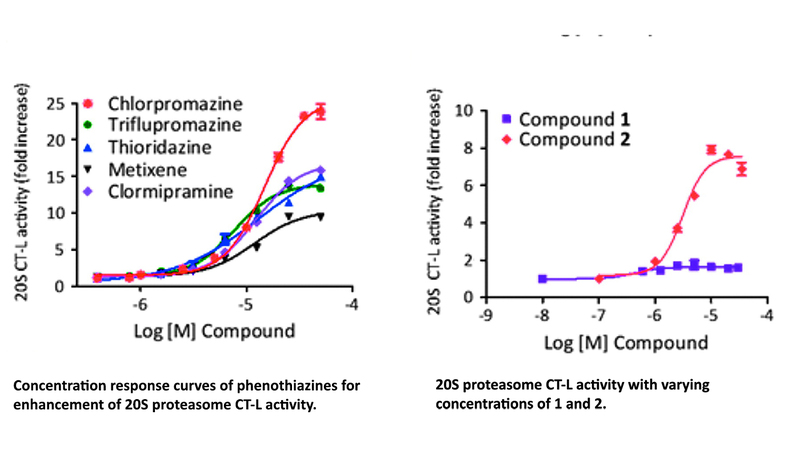 Screening of the NIH Clinical Collection and Prestwick libraries identified a series of phenothiazines, including chlorpromazine (CPZ) as activators of the 20S proteasome. A two- to four-fold activation of activity was found for chymotrypsin, tryptic, and caspase activity with EC50s in the 4–10 μM range. Docking of CPZ into the 20S proteasome structure suggested that the compound binds to α-subunits pocket within the α-ring, inducing a conformation that opens the gate, allowing access to the proteolytic β-subunits. Interestingly, CPZ showed degradation of intrinsically disordered proteins such as α-synuclein but not structured proteins such as GAPDH. CPZ analogs were synthesized and were aimed at reducing the activity of CPZ at the dopamine D2 receptor (D2R), which is responsible for the neuroleptic effects of CPZ. Modeling suggested a critical interaction with long chain at position R1 with Arg38. Chain-length extension effectively reduced the activity at D2R (Ki ≥ 250 μM), and one analog maintained the interaction with Arg38, resulting in 10-fold activation in the 20S proteasome assay with an EC50 ∼16 μM. Cell-based activity was confirmed using the intrinsically disordered domain from ornithine decarboxylase (ODC) fused to GFP. In addition, CPZ and active analogs selectively degraded tau protein in cells but not structured proteins such as GAPDH, Hsp70, and β-actin. This paper adds to the increasing toolbox of proteasome activators, which will be useful for studying proteasome function in disease, as well as the construction of cell-based assays. Overlay model of chlorpromazine and compound 2, docked in the a1/a2 binding pocket, and their interaction with Arg83. Overview of the Probes & Drugs portal. (a) Filtering system enhanced by Boolean logic with three selected filters (from top to bottom): a target filter with a minimum–maximum bioactivity threshold, compound set filter and structural similarity filter with a minimum–maximum similarity threshold. (b) Visualizations that can be applied on a currently filtered compound set (from left to right): Venn diagram, 2D chemical space visualization, cluster heat map, pie chart with selected target–pathway classes and selected physicochemical property distributions. 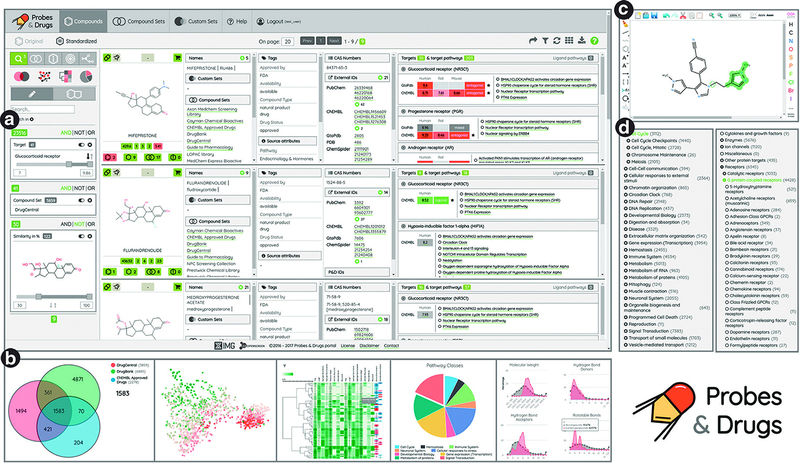 (c) Chemical structure editor used for identity, similarity and substructure searches. (d) Selected ontologies, a target ontology on the right and a pathway ontology on the left. The 20S proteasome is the main protease for the degradation of oxidatively damaged and intrinsically disordered proteins. When accumulation of disordered or oxidatively damaged proteins exceeds proper clearance in neurons, imbalanced pathway signaling or aggregation occurs, which have been implicated in the pathogenesis of several neurological disorders. Screening of the NIH Clinical Collection and Prestwick libraries identified the neuroleptic agent chlorpromazine as a lead agent capable of enhancing 20S proteasome activity. 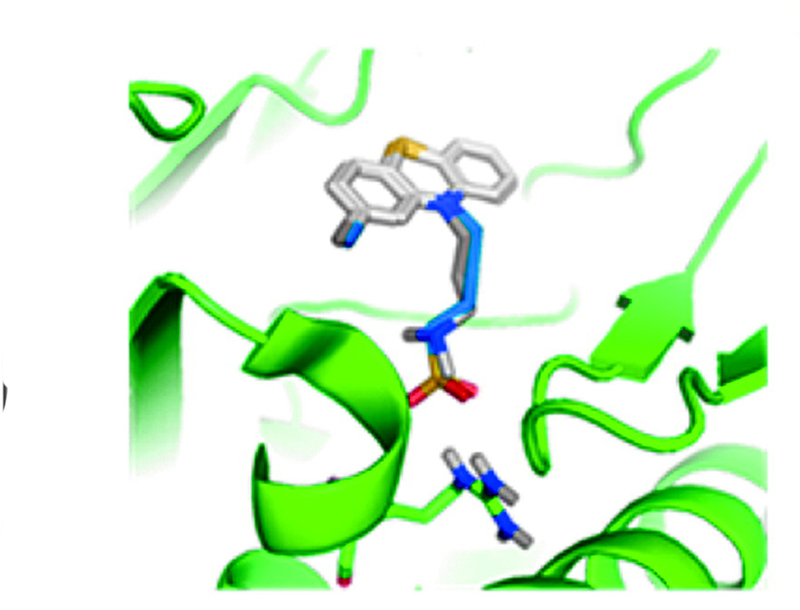 Chemical manipulation of chlorpromazine abrogated its D2R receptor binding affinity while retaining its ability to enhance 20S mediated proteolysis at low micromolar concentrations. The resulting small molecule enhancers of 20S proteasome activity induced the degradation of intrinsically disordered proteins, α-synuclein, and tau but not structured proteins. These small molecule 20S agonists can serve as leads to explore the therapeutic potential of 20S activation or as new tools to provide insight into the yet unclear mechanics of 20S-gate regulation. ASSAY & Drug Development Technologies, published by Mary Ann Liebert, Inc., offers a unique combination of original research and reports on the techniques and tools being used in cutting-edge drug development. The journal includes a "Literature Search and Review" column that identifies published papers of note and discusses their importance. GEN presents here one article that was analyzed in the "Literature Search and Review" column, published in ACS Chem Biol titled "Small molecule enhancement of 20S proteasome activity targets intrinsically disordered proteins", authors are Jones CL, Njomen E, Sjögren B, Dexheimer TS, Tepe JJ.